Ontamarama is hard to pronounce. Come on, look at all those syllables. Interestingly enough, the circumstance of its name can also be applied to the game itself. 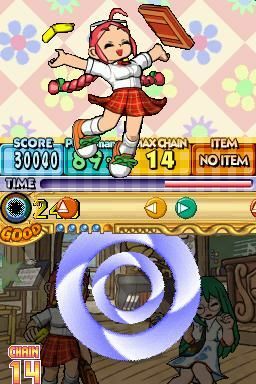 Publisher Atlus gives us a unique sort of dance-puzzle game. And for the most part, it gets us into its groove, only sliding off key in a few areas. It’s a creative game that requires both your attention and, unfortunately, your tolerance. Ontamarama feels at first like another puzzle-music game, and at its core, it is: arrows move across the screen, and you tap the d-pad in the corresponding direction. But that's only at its core; the added fruit filling is straight-up abnormal. The ontama - strange, weird little balloon-like creatures - make the whole formula a bit more interesting by requiring you to double-task. Basically, before pressing in the direction of an arrow, you have to tap an ontama - which then bursts - of the same color. This would be one thing if the ontama were all red or blue, but there are also white ones that give you bonuses, as well as black ones that you have to throw offscreen to reveal the candy-colored ones underneath. Some require multiple taps to explode, and others can be lassoed in groups with a quick swish of the stylus. All of these different-colored ontama provide a lot of challenge, though they could be better integrated into the music. As it is, they create a parallel, but separate gameplay system that often distracts you from the rhythmic musical action instead of enhancing it. Description This weird get-your-groove on type of game has too many problems to make it good and not enough problems to keep you from checking it out.